Hi! I'm Audie and I'm looking for my forever home! I'm currently in an awesome boarding place called Training Wheels in Broomfield, CO, where I get to run and play with my very favorite big red ball! 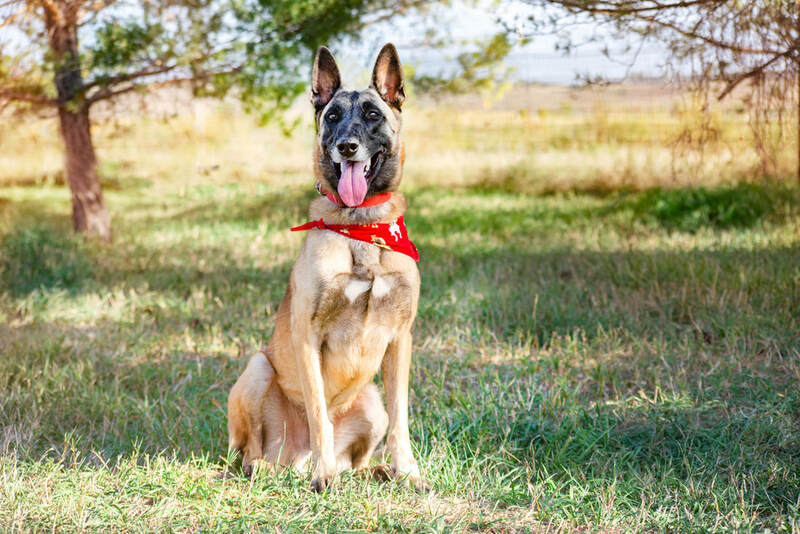 I'm a Belgian Malinois, and that makes me not only very handsome but very special -- so they're looking for a home for me where my new peeps will be familiar with Belgian Malinois personality traits: loyalty, intelligence, eagerness to learn and a big need for activity and stimulation. I love to run! My dream job? Your personal fitness coach to keep you strong and healthy! "Audie was a stray from a high kill shelter in the Chicago burbs. He knows Sit, Down, gives Paw, and High Five. Are you looking for a big boy that is tennis ball/ Kong obsessed? Then Audie is your guy. He weighs about 80 pounds and just loves to run around. As long as he has a ball or a Kong in his mouth he's a happy boy. Audie's not big on giving up his Kong but he will trade up. He wants a family that is interested in doing a lot of training. He would love nosework and tracking. The shelter gave his age at 5 but his teeth are absolutely beautiful so we place his age at closer to 3. He will need a home without children, cats or small dogs. He's housebroken. Audie will need an experienced and confident owner. He does not like to be confined and his new owner will have to continue to work, using positive training methods, to encourage Audie into a crate or kennel. Audie is working on his dog to dog manners - he plays very rough and can be inappropriate with other dogs. He is not aggressive but is currently learning better manners. He is not a candidate for a dog park or a home with many other dogs. Audie needs an experienced owner who has the time to spend with Audie and who will enjoy working with him to continue his training."